18 holes, par 72, 6436 yards. Parkland. 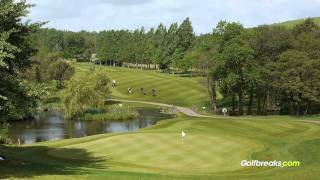 The Lake Course is located at The Vale Resort in Cardiff, alongside the Wales National Course which is probably the more famous of the two golf courses. At the base of this brilliant par 72 parkland course is a 20-acre lake which comes into play on no less than 12 holes, showcasing some of the best holes on the course. The large lake has a particular influence on the unique signature hole (12th), whereby water surrounds an island green - acclaimed to be one of the UK’s best and most exciting holes. Another memorable hole is the 8th - a 210 yard par 3 which looks over the largest heronry in Wales. Although it’s not quite as illustrious as its big brother, The Lakes Course should not be overrated and would make a fine addition to any golf vacation to Wales. There is a small chance that you may be paired up if the course in overly busy. Only for the Wales National Course. Golf carts are available for £25, electric trolleys and pull trolleys (£4) are also available.